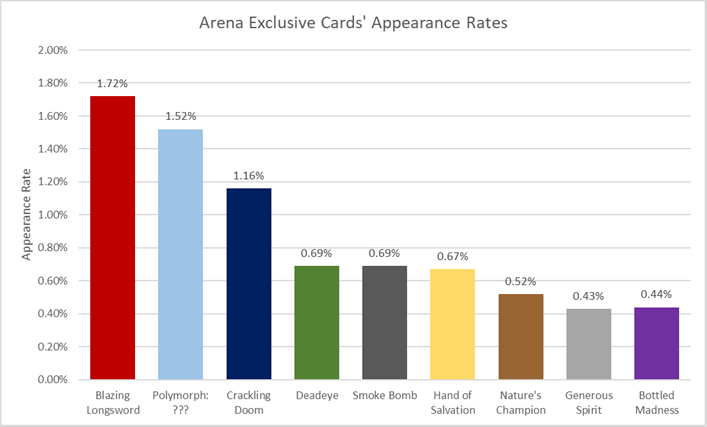 Along with some pre-expansion preparations, Patch 10.4 brought some interesting changes to the Arena, notably 9 new class cards exclusive to the Arena format. These cards were chosen at Blizzcon between a selection of 3 cards for each class. 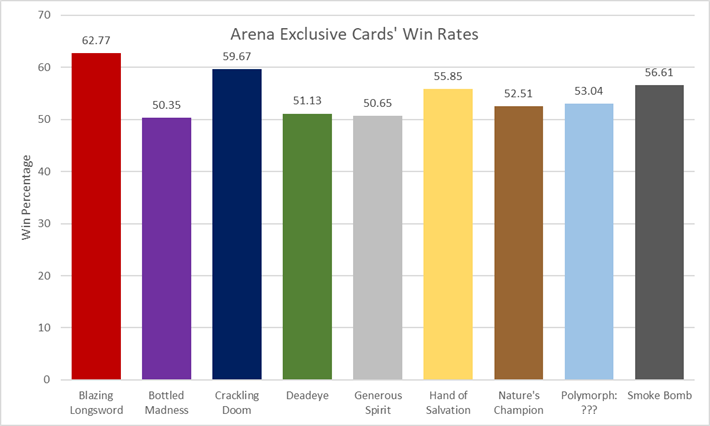 With the rotation happening tomorrow, let's take a look at how the cards ended up performing and were they really worth drafting in your Arena deck? Blazing Longsword, Smoke Bomb, Polymorph: ?? ?, Hand of Salvation, Crackling Doom, Bottled Madness, Generous Spirit, Deadeye, Nature's Champion. Right off the bat, we can see that cards like Blazing Longsword and Crackling Doom completely outperform the other cards by a large margin. Hand of Salvation and Smoke Bomb are also doing pretty well so let's talk more about that. 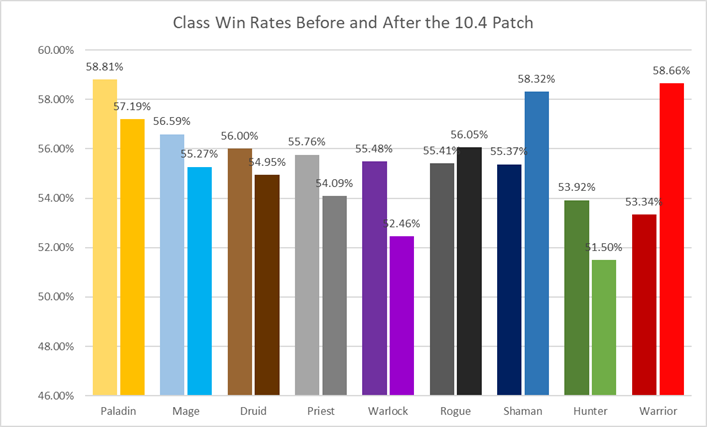 The first bar for each class represents their win rate before the new cards, and the second bar is the win rate after the cards were added. Let's talk about Warrior and their Blazing Longsword. The weapon allows the Warrior player to control most, if not all, of the early minions an opponent might play. The three attacks you get with it let you spend your mana efficiently while the opponent has a hard time having small to medium size minions remain on the board. This card's absurdly high power level has single-handedly made Warrior a worthy class in arena. Make sure you don't draft too many in one deck or else you might end up with all of them in your opening hand. Shaman has also gotten a boost. Crackling Doom is the board removal we all dream about. At 0 mana, it allows powerful board tempo swings where you destroy everything your opponent has and gain the board all to yourself at the cost of not playing anything next turn. This card works great when the game is in its mid-stage and even better when both players have very few cards in hand. Your one card destroys everything they cherish. This card is definitely worth drafting and in multiples, since it's good at most stages of the game. Rogue is on a different level. The card they got, Smoke Bomb, seems to have improved their win rate a tiny bit, even if the card itself doesn't have an absurd win rate. It's an overall solid card with many utilities, but most importantly, it's just fun to play. Now the Paladin card, Hand of Salvation, is a harder one to judge. Paladin still remains the strongest overall class in arena with Warrior closely behind. This means that cards played in a Paladin deck will have a higher win rate than others that aren't, simply because the deck still wins either way. The other classes' cards are not very impressive, they don't affect the win rate much other than maybe reducing it. All these cards have a lower win rate than the class they are played in meaning they most likely don't help you win games. This graph is all about how often the cards appear in a given game. Blazing Longsword and Crackling Doom are clearly played a ton along with Polymorph: ??? giving us an accurate representation of how the cards perform. On the other hand, the Paladin card is not played very much, so its relatively high win rate doesn't mean the card is worth playing. In the end, Blazing Longsword, Crackling Doom and Smoke Bomb were the only cards that appeared to be worth drafting. This was a successful experiment in Arena and hopefully Blizzard will do more of this in the future.